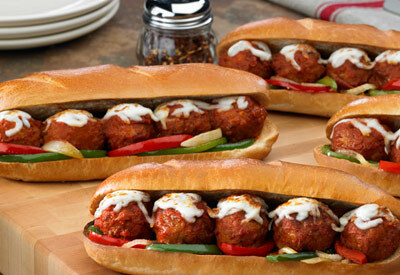 This Italian-inspired sandwich uses onions, peppers and mozzarella cheese to get the party started, but Johnsonville Three Cheese Italian Style Meatballs make this meal a taste extravaganza! In a large skillet, cook meatballs, onion and peppers in oil over medium-high heat until vegetables are tender. Stir in pasta sauce; bring to a boil. Reduce heat; cover and simmer for 10 minutes or until meatballs are heated through. Place rolls on a foil-lined baking sheet. Fill each roll with meatball mixture. Sprinkle with mozzarella cheese. Broil sandwiches for 2 to 3 minutes or until cheese is melted and rolls are lightly browned.